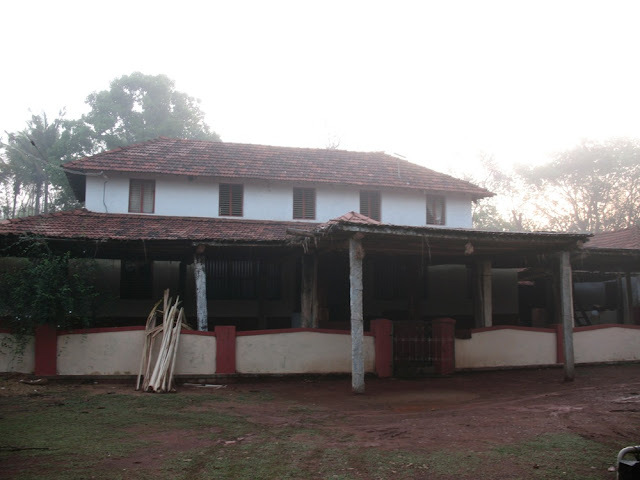 We drove to Ravi’s ancestral home, which was off the main road; in a place so interior where the darkness prevails and adds beauty to the night, what I mean is there are no artificial lights to interrupt the silence of darkness. I was introduced to the joint family living in the house and I soon began to observe the life in such a place where men sit in the main hall to discuss politics and hobbies with their mouth full of areca nut and beetle leafs; women happily chat in the kitchen while cooking. In this house now live, 3 of 6 brothers with their family. The eldest of the brothers, has no kids; the second brother has a son of almost my age; the third brother has a son of around 5 years, who grows up in the house as everyone’s dear. The people seemed to me so united and peaceful in their own world and occasionally they got a glimpse of the rest of world through newspaper, visitors and travels to relatives in cities. The second brother and his son both sing in Yakshagana’s and from what it seemed to me, the boy was passionate about the art form. Since we arrived, he discussed only Yakshagana with my father and even enquired if I had interest in the art form. I said I loved to watch it but was not part of it in any other way. He probably was disappointed and did not speak to me after that. His father is a well known Yakshagana Bagvath and also trains a girl’s yakshagana troupe. My father asked the father-son duo to sing few verses and they immediately got the Harmonium to start. After the father, the son sang. Father kept correcting his son, asked him not to scream, but to understand the literature involved, before singing, which he thought, is very important in singing. The son ignored the advice and kept singing in higher pitch. By then one of the ladies called us for dinner. The food was amazing. The village atmosphere can never be complete without such a wonderful meal. Rice, sambhar, saar, a brinjal dry dish, chatni and mangoe rasam. One of the brothers kept asking me to try the mangoe rasam which he said would provide me a good sleep. After food, I helped out the second brother with his newly gifted cell phone. He was too enthusiastic about knowing the features. According to the plan, we had to go to more places the next day, but looking at this atmosphere, I did not feel like continuing with decided, so we instead decided to stay in the house and spend time there. 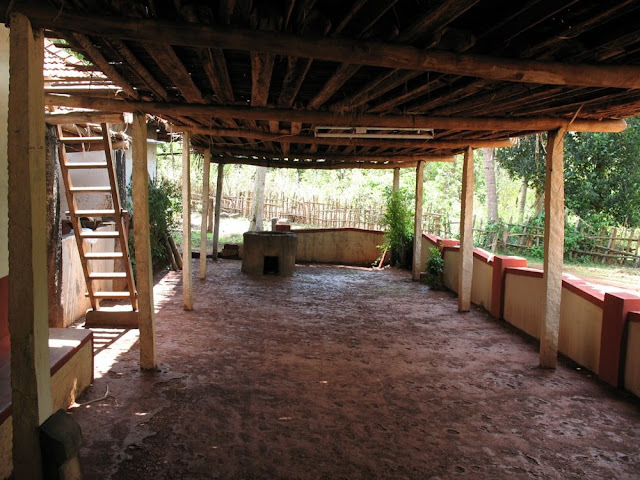 I had the best sleep, it was pitch dark and I needed no fan, it was cool and the tiled roof aided to maintain it. Next morning, I got up to view a silent, serene atmosphere; the women had already become busy in the kitchen. It appeared to me that they had standard routine and established roles even in the kitchen that went on day after day, with perfect harmony. I took a short tour around the house, to click some pictures. I was surprised to view what the curtain of darkness had unfolded into. 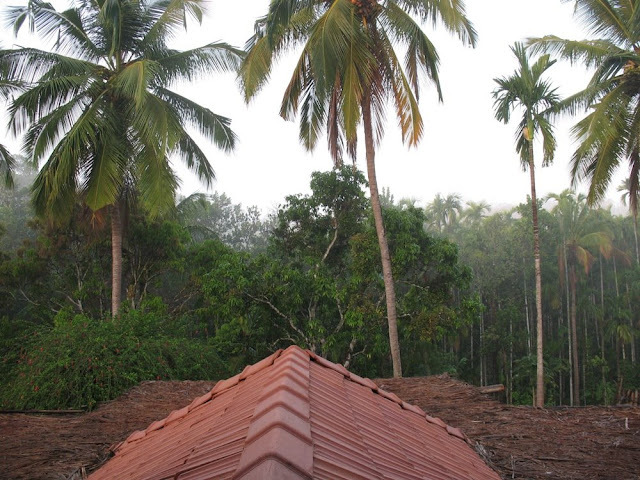 I was standing in midst a forest, part of which comprised of a house, temple and areca nut farm. After delicious idli and fresh and natural jaggrey paste for breakfast, I was asked by the eldest brother (I would refer to him as Yajmana (Head) now one) to be taken to the farm. The third brother took me on a tour of the farm. We discussed about the falling price of arecanuts and vanilla. 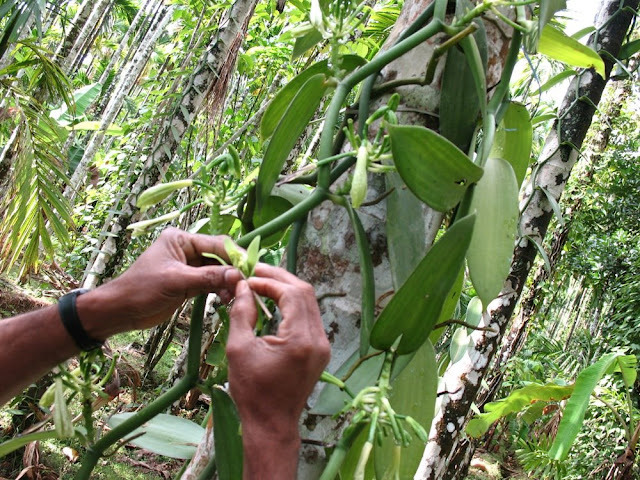 I did not know until then that vanilla plantations were such a pain. Every single flower had to be pollinated manually and the price has fallen considerably, which makes the entire process even more worthless. Even the unseasonal rainfall this year has turned threat to areca nut flowers. They also have acquired some forest from Government to protect it. A small pond at a height acts as water supply to the farm. 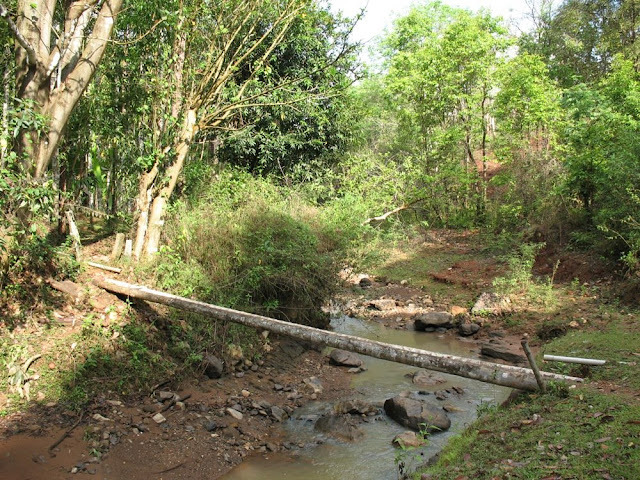 A small stream too, flows in between the farm. He showed me few herbs that are used for masala. Areca nuts are boiled in the furnace. The roof above is where they are dried. We discussed also on the labor issues in the place now, many youngsters have moved to bigger cities or to better jobs and hence, it is very difficult to find labors to work in such big farms. In my conversation with the third brother, I realized that the life in villages was not as simple as we thought or as it was few years back. The villages are forcibly diminishing by the globalization and it is inevitable. The neighboring farm was sold away by its owner due to lack of labors. What India needs today is automation and less can it depend on human labor or the conventional ways. Man has to create remedies for the disasters he himself has initiated. A nice cosy family atmosphere. Joint families have a charm of its own. You take good pictures too. I liked the one in which the sky is visible between the arecanut trees. What was/were the most emotional moments for you in that journey? 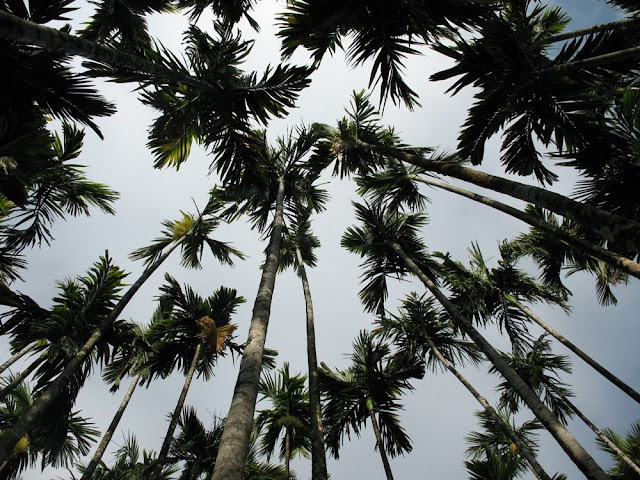 The picture of the arecanut tree tops against the sky is fabulous. The photoes and other descriptions reminded me of my grandmother s place , near Koppa , where we used to go every summer , for 2 months ... And those were the best days ..with more than 20-25 kids together !! Now most of them are likely to settle , in Bangalore ..or elsewhere..including my maternal uncles children. ( Who would otherwise look after those agricultural land and house ). It s the same story in every household there...Sad , but inevitable at the moment. And now when I go there, I can feel the lack of old warmth and generousity and simplicity of the people , probably because of modernisation...Or Is it me who has lost the warmth .. could be ..? I m not sure... :) ..Things are not the same ..That s what I mean ..I think u understand that too.. I have lived in a joint family till i was 13 and my dad had three brothers and all of us cousins had a blast despite everything..someday I want to write a book on that .. The labour issue is real..my uncles run a coffee plantation where we also grow vanilla and other crops...the labour issue is very much there..Im going to be doing a post on coffee soon ..
Nice write-up. Having known these places and the people personally, can relate to it all. Reborn - I understand you very well, I think this is one of the side effects of growing up. YOU move towards independency from dependency and also away from the close bonding we share as kids. I wonder if the next generation would even get a glimpse of what we have lived. Lakshmi - True, those were some great days. Waiting for your post on Coffee. i like like like the third picture... brilliant! !